Celebrate Hispanic Heritage Month with these 4 Recipes! It's Hispanic Heritage Month (September 15 - October 15) and you know what that means right? It's time to celebrate family and traditions with good food. One of the most important things I learned from my grandmas is that the best memories are made when family comes together. Over the years, I've also learned that family will always come together, especially when there is good food. Today I'm sharing 4 recipe ideas that are sure to bring family together. As much as like to bake and spend time in the kitchen, I also like to find shortcuts and ways to save time. Stouffer's always comes in handy with saving time. I bought STOUFFER'S® Family Size Chicken Alfredo and decided to add a twist. This time I added Chorizo! Oh, you know how I love Walmart. I can find everything I need for my recipes and celebrations. Check out this Stouffer's® Frozen Meal Rebate right here. What I like most about Stouffer's is that it's as easy as throwing in the oven and letting it cook on it's own. This time, I cooked a small amount of Chorizo on the side, let it drain and added it to the Alfredo for the last 15 minutes of baking. The flavors worked so well together. The creamy Alfredo balanced the spice of the Chorizo and the pasta and chicken added a nice bite. This is perfect for a party. Make a few family size trays and sprinkle some chorizo last minute, that's it. I have learned several variations of bread pudding from my grandma and my husbands grandma. But this one, is mine. This is my variation and if your abuelas are anything like mine, then you know they would definitely not approve of the changes I've made. Chop the bread to 1 - 1 1/2 inch cubes place on a baking sheet and sprinkle with cinnamon. Place in the oven for about 2-3 minutes. Just until the bread becomes slightly toasted. Fry the platanos maduros, per the package instructions. Set aside to drain the oil and chop into quarters. 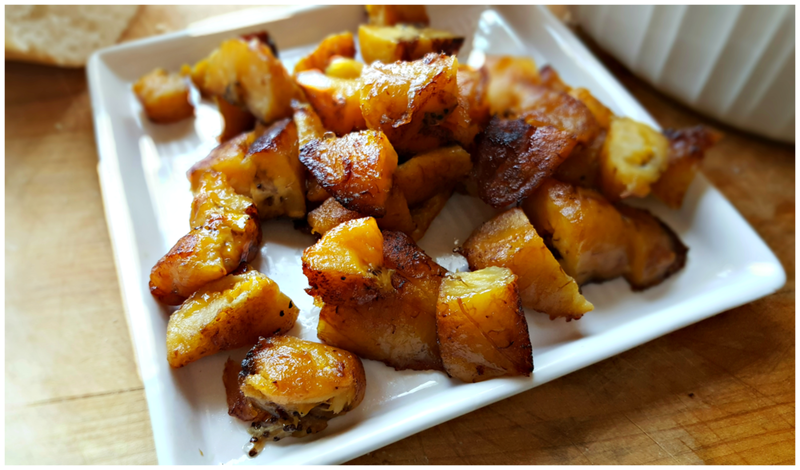 Add quartered platanos and cubed bread to a 9 x 11 baking dish. Make sure platanos are evenly distributed throughout. Next mix the wet ingredients. Whisk together melted butter, Sweetened Condensed Milk, cold milk, eggs and vanilla. Pour the mixture over the bread and platanos. Cover with foill. Bake for 40 minutes. Remove the foil and bake another 10 minutes or until you see the top start to brown. The top will be toasted, the bottom will be moist. While the bread pudding bakes, you can mix the icing. Whisk the powdered sugar, milk and vanilla together until you get the consistency you like for icing. If you like yours thicker, add more sugar, or thinner add more milk a splash at a time. Serve warm with icing drizzled over the top. 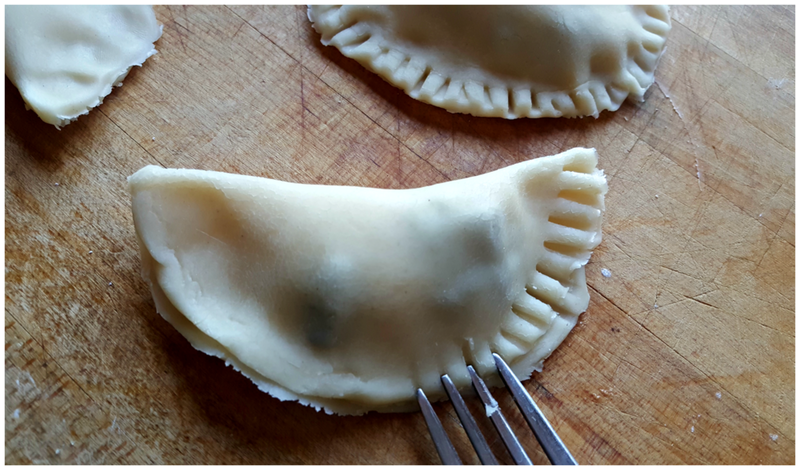 Empanadas are some of my favorite party foods. First of all, I love that you can make them sweet or savory just depending on what you fill them with. But whenever I make them sweet, I usually have the kids in mind. They just fit so perfectly in their little hands, but of course adults will love them too. Cut circles with a 4 inch diameter, I used a small bowl for my circles. Mix cream cheese and powdered sugar until you get a frosting like consistency. *Try not to lick the spoon. Place a dollop of filling, about a tablespoon, on to half of the dough. I sprinkled morsels on top of the mixture as a layer, instead of mixing it in. Next fold the circle in half and close with a fork. Last brush egg yolk over the closed empanada and sprinkle with sugar. Bake for 7-9 minutes or until nice and golden. 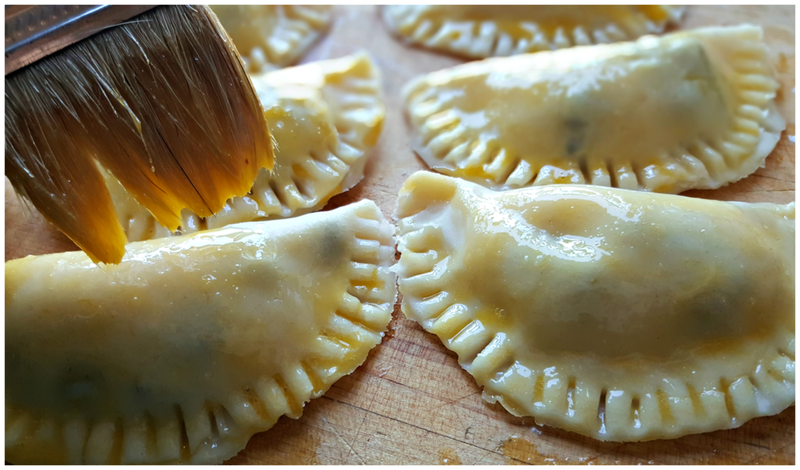 While the empanadas are baking, you can make the chocolate drizzle by melting the butter and vanilla in the microwave and mixing in a 1/4 cup of Semi Sweet Morsels. When the empanadas are nice and warm, drizzle some chocolate or even dip the empanadas if you like. I remember the first time I had cafecito. I was eleven years old and I was visiting family in Guanajuato. The family that was hosting us served me a nice warm class of instant coffee. I would like to say I've been hooked ever since, but that's probably not exactly true. Most of the time when people start making coffee at a party, it means the party is coming to an end. 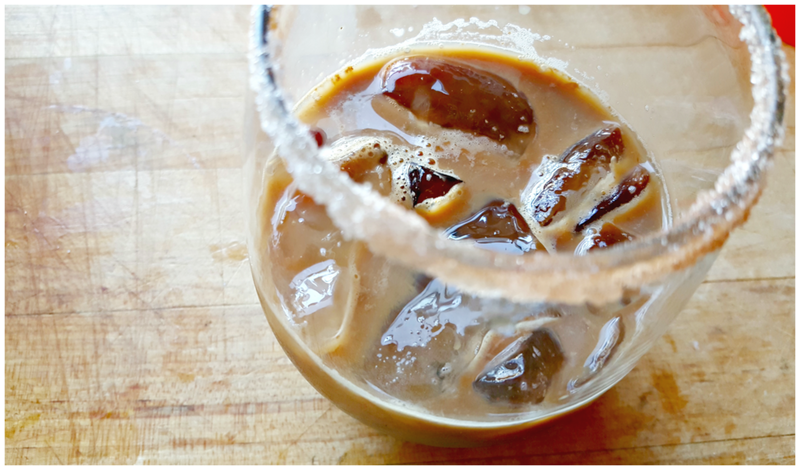 But that's not the case with this Iced Café de Olla. This drink can definitely be a main beverage served at a party. Pour milk into a small saucepan over medium heat. Mix in the Nescafe Café de Olla Instant Coffee and stir until dissolved and completely heated through. 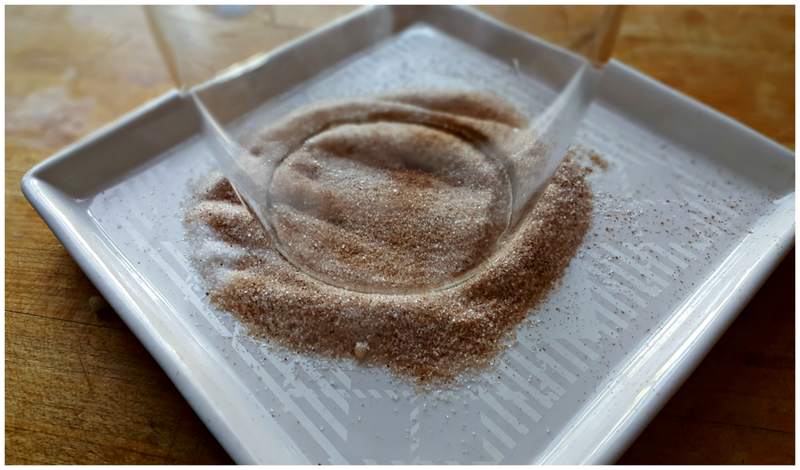 Mix cinnamon and sugar on a plate. Wet the rim of the glass and turn upside down onto the cinnamon/sugar mixture, until the rim is coated. Fill the cup with ice. Pour the hot coffee over the cup of ice. Add the French Vanilla Coffee Creamer and mix. Sprinkle a little extra cinnamon and sugar on top. To be honest, all of the food will speak for itself. When you are ready to decorate your table, pull out your sarape (Mexican blanket) or any culturally relevant fabrics that you may have on hand and lay it out. They are usually very bright and add so much color and texture as well. Another great idea for decorating for a Hispanic Heritage celebration is using things you have around the house. For example, I have these Dia de los Muertos style coffee mugs in my window, add a plant and now you have a centerpiece. My biggest tip for decorating for Hispanic culture, is searching Pinterest. You can find ideas and patterns for creating your own Papel Picado and check out this Flavorful Moment Pinterest Board for even more delicious recipe ideas.